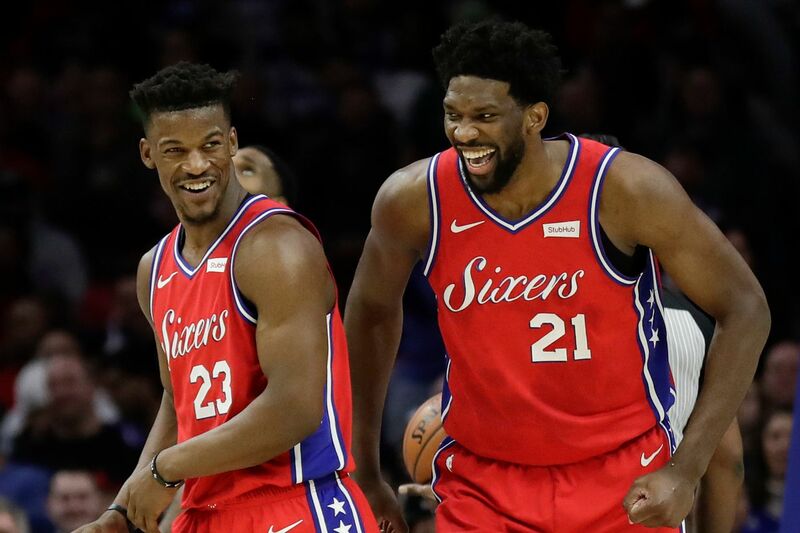 Jimmy Butler (23), Joel Embiid (21) and the other three Sixers starters have played together only nine times. ORLANDO — From his days as a San Antonio Spurs assistant coach, Brett Brown knows this is a good time to rest starters in preparation for the postseason. But Brown doesn’t have that luxury this season as 76ers head coach. His Sixers need more time to jell and are in pursuit of the Eastern Conference’s third playoff seed. “Once that becomes established, then you can figure out other options if you want to,” Brown said. “Because we have played so few games together, the importance of keeping these guys as much as you can on the court and experiencing playing with each other is really important. The Sixers were without starting point guard Ben Simmons in Monday night’s game against the Orlando Magic at the Amway Center due to a stomach virus. As a result, the Sixers only nine games out of a possible 20 games that all five starters played together since starting power forward Tobias Harris and reserves Boban Marjanovic, Mike Scott, James Ennis III and Jonathon Simmons were acquired via trades on Feb. 7. The Sixers (47-26) are 7-2 when their usual starting lineup — Harris, Jimmy Butler, Joel Embiid, JJ Redick, and Simmons — takes the court. But because of load management, Embiid could sit out at least another game, possibly in a back-to-back situation. Philly is 2½ games ahead of the fourth-place Pacers (45-29) with nine games remaining. The Sixers’ next matchup after tonight will be Thursday at the Wells Fargo Center against the Brooklyn Nets. The Nets (38-36 as of Sunday) hold a 2-1 lead in the season series and could be the Sixers’ first-round opponent. The Sixers have to be thankful that Thursday’s game will be at home, where they are 29-9. The 29 home wins are tied for second most in the league, behind the Denver Nuggets (30).